Leh Ladakh in September – How to Plan your Trip and Explore? Ladakh opens up for tourism sometime in the month of May when Srinagar to Leh route is declared open. By early June, the road from Manali as well is cleared for vehicular movement. Come July and the tourist season is at its full swing and remains so for the next three months. Things start to wrap up in October and with the arrival of November, it is all over for the season. The wait then begins again for the next year; when the winter would have passed and the valley would be accessible by road. Of all these months, if you asked about the best time to visit; then the chances are that at least 7 of 10 times you will be advised to visit Leh Ladakh in September. So why September? It is majorly considered as best time to visit Ladakh (at least by people who are familiar with the terrain) but why? There are several reasons behind this which I will discuss further in this article; along with a few other tips on how you can plan your trip for better. The reason why visiting Leh Ladakh in September is considered a good idea is of more convenience and lesser risk. Convenience is in terms of road conditions which in September is as good as it will ever be. By now, the restoration work in the entire region is almost complete and roads will be in their near perfect condition. After September, it is just the harsh winter ahead and roads won’t get any better. If you went in the month of May or June, then it would be the opening of the season; and you will be met with badly broken roads; that BRO would have just started to work upon. This is also the time when snow would have just started to melt and there will be numerous water crossing en route. If you however went in the months of July and August then the problems would just increase further. Monsoon arrives in Himalayas by July and after that, there is no telling when and where it may rain. Landslides and cloudbursts up in the hills are common in these two months. Remember the Ladakh cloudburst of 2010 that killed hundreds? That happened in the month of August. Another problem with monsoon is the increased flow of water in water crossings. In July and August, fed by melting snow and rain, these small rivulets turn into monster nallahs and post a great challenge to cross. This was in terms of safety and convenience. But this is not all that September is all about. It probably is also the best time in terms of vistas. Monsoon would be long gone by September but the greenery won’t. You will still be treated by lush green hills in Lahaul and Kashmir valleys. It is the start of the autumn season and the views en route and in Ladakh will leave you spellbound. Last but not the least is the tourist crowd. Ladakh in recent times has started to get real crowded in peak tourist season. A few times people could not find a place to stay overnight at Nubra and Pangong; and had to return to Leh city. September on the other hand is considered as the end of tourist season. While there will still be tourists here, it won’t be as crowded as it was in prior months. How to Plan a Trip to Leh Ladakh in September? And that is why visiting Ladakh in September is considered a better time than other months. How you can plan your trip and what are some of the things you should keep in mind is what I will provide information on in this post. Is Ladakh Open in September? The answer is a definite yes. Ladakh is completely open for tourists in September. Though it is considered as the end of tourist season, all hotels and guest houses here remain operational well into October; as well as the other tourist related activities like taxis, bike rentals, rafting etc. The entire region of Ladakh including Nubra valley, Pangong Tso and Tso Moriri too are accessible by road in September. There will still be plenty of these but the intensity and flow of water will depend on your time of travel. If you were traveling in early September, then there will be plenty of water flowing through. As September progresses however, the weather starts to get colder, reducing the snow melting process and thus the water in the streams. If you were traveling towards late September, there will only be a few large water streams en route. Smaller ones would already have vanished. This is more or less related to the point above. As the flow of water decreases, some of these streams get reduced to mere puddles of water; or just a little bit of water flowing across the road. Problem arises however when this water freezes overnight and forms black ice on the road. This problem is more towards the second half of the month than first. If you were traveling towards end of September then it would be best to wait for the sun to come up before starting your journey for the day. This way, the black ice ice at least would have melted away. There of course cannot be any traveling involved at night; after dark or before sunrise. One of my personal favorite times to ride a bike to Ladakh. Roads will be smooth, there will be no rain and the views will be mesmerizing. If you have even slightest of interest in photography, then you would find yourself stopping at every turn to click more and more pictures. The only word of precaution here would be to prepare for cold. It starts to snow at high altitude passes like Khardung La and Chang La towards mid September. Even at passes like Baralacha La and Zoji La, there could be lights showers of snow overnight. This also will get related to the Black ice point I mentioned above. So when planning a trip to Leh Ladakh in September, ensure that you are carrying a proper riding gear that can keep you warm throughout the ride. This will include thermals, a heavy windproof jacket and good quality gloves. And once again, wait for the sun to come up before starting the journey. If there was any snow on the road from the night before, a bit of sunlight would ensure that it has melted away. This actually applies irrespective of the time you are going to Ladakh. You should not tie yourself down to strict timelines. Keep at least one day as buffer in your itinerary. This way, if you got stuck at some place for a day or two, you would at least be able to afford it without something going wrong at home in your absence. If your trip went as planned then you could use this day to just relax at the end of the trip. Weather in Ladakh starts turning cold in September; but it won’t be unbearably cold. In the first half of the month, it would still be pleasant; days will be moderately warm but the temperature will drop at nights. By mid of September, it starts to snow at Khardung La and Chang La top which brings cold winds even in lower areas like Leh city and Nubra valley. Snow is often accompanied by rain. So when it is snowing at top of the passes, lower areas may witness a bit of rain. The frequency however won’t be that great and is more towards later part of September. Continuing from the point above, a trip to Ladakh in September means that you would have to bring your winter clothes. It does not matter if you were coming by motorcycle, car or flight; your packing would have to include a pair of thermals, woolens, good quality gloves, if possible then warm socks and a good heavy windproof jacket. Make sure that your jacket has a hood to protect your head, face, ears and neck. If not then please pack a muffler as well. Does it snow in Ladakh in September? The answer is a yes but as I mentioned above, at top of the peaks only. Chances of a snowfall in Leh city or other places like Diskit or Hunder are very less. There will not be any snow in Leh in September or even October as well. In lower areas, it starts to snow only towards November or December. It is still the tourist season so all hotels and guest houses will remain operational in the month of September. It is only after October first week that they start to wind up for the season. In last few years, Ladakh has started to get a bit crowded and finding a hotel in the months of June till August can be a bit of a challenge. This however is not the case in September. By this time, the number of tourists starts to go down and you can easily find a place to stay. Hotels in Leh in September as a matter of fact will cost you even a bit less than other months. With that being said, a lot of people still chose to book in advance and you may do so for your peace of mind. For budget travelers, I will recommend that you arrive at your destination; find a hotel per your liking; and negotiate an on the spot deal. You can definitely plan a journey on Manali Leh Highway in September. It is only after early October that traveling on Manali route becomes a bit risky. The road remains open until Mid October though; and then is declared closed after it starts to snow at Baralacha La. So going from Manali to Leh by road in September is perfectly safe. Do keep in mind though that the longer you delay it, colder it will get. If possible at all, then plan your journey in eary part of the month. As I mentioned previously, it starts to snow in Ladakh in September. Between Manali and Ladakh, there are 5 high altitude passes and it may very well snow at top of either of these. If not heavy than a light shower of snow is defintiely possible. Srinagar Leh highway remains open for a little longer than Manali Leh highway.In 2017, the road was open until early December so there should not be any problem in traveling from Srinagar to Leh by road in September. But yes, there is a high chance of snowfall here as well. It won’t snow in lower areas but a light shower of snow is definitely possible at top of passes en route like Zoji La. Also Read: What to See on Srinagar Leh Highway? All of it and as many as time permits. The entire region remains open for tourists in September and the only restriction will be the number of days you have. Further in the article, I have suggested an itinerary that you can follow including all major tourists places to see. So in order to summarize it all here is a breakdown of how Ladakh would be in which part of September. Ladakh in September first week: This is the best time to visit. Plenty of greenery en route on both Manali – Leh and Srinagar – Leh highways. If you are a bit into photography, this is the time when you should plan a trip. Leh Ladakh in Mid September: It will start to get a bit cold at this time and chances of snowfall at top of the passes would increase. Number of tourists in Ladakh would start to go down and you may actually get better deals at hotels. Ladakh in September End: If you are planning a trip to Ladakh in September last week then ensure that you are bringing plenty of woolens, thermals and a heavy windproof jacket. It would already have snowed at top of high altitude passes by now. Temperature at nights would definitely drop close to 0 degrees Celsius. Ladakh in September- October: If your trip was in a way that you were traveling in last week of September and first week of October then it would be better to go via Manali Leh highway and return via Srinagar. That I think covers all that there is to know about visiting Ladakh in the month of September. To end it, below is an example of an itinerary that you can follow. For the sake of this article, I will assume that you are traveling from Delhi. If your starting point was different, then only the journey for first and last day will change; rest of the details will still apply. Can we visit Ladakh in September? Yes, definitely. Just keep in the mind the points I mentioned above and have a safe journey. I hope the information above was of help. If you have any other questions; or need any further details; please feel free to ask in the comments section below; or at our Community Forum; and I will be glad to answer. hello sir, starting the ride from delhi is good idea or not? Hi Vargis. Even I have the same concern. Flying to Leh on 28th september and returning on 3rd. Itenary is some what sorted and planned (thanks to your various articles). Just one thing, we want to travel as light as possible, so other necessary items we ll carry but can we get riding gears (windproof jackets, gloves, gaurds etc) on rent there itself in Leh? Hi Shubham – Yes you can get riding gear on rent in Leh but it would be better if your brought your own. It is going to be cold in Leh anyways so just wear it as you catch the flight, if you were worried about the allowed weight in the flight. If yes then how should we plan. Hi Ashish – No, it is not doable. Your website, writing and photography are the very best! Thank you for all of your information! I am planning to make a bike journey from Manali to Leh via Jispa and back via Sringar departing Sept 23 and returning to Manali by Oct 10. I plan to rent a bike in Manali, take 2-3 days to reach Leh and then visit Tso Moriri, Pangong Tso, and Diskit areas over a weeks time before traveling toward Srinagar stopping Kargil and Dras on the way. Then visiting Gulmarg if time permits before traveling back to Manali staying in Kishtwar and/or Killar on the way. 1) Is this itinerary doable in 16 days or is it too ambitious? 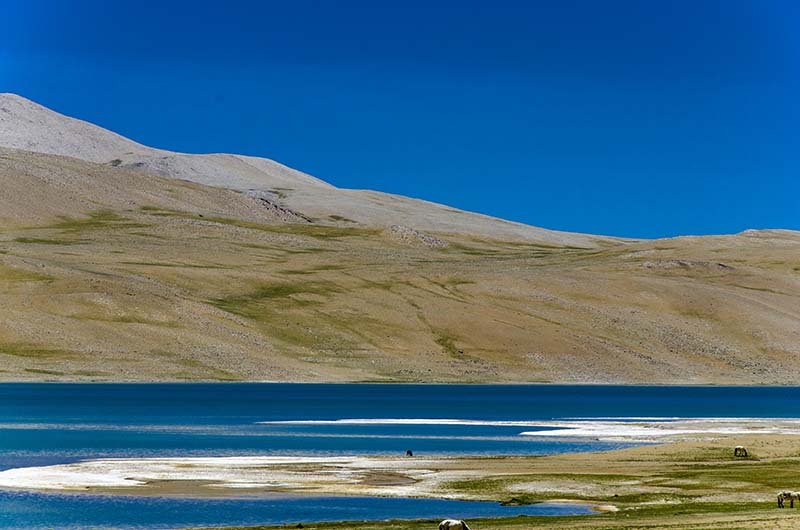 2) Do you recommend visiting Tso Moriri and Pangong Tso on the way to Leh or traveling to Leh first and then to the Tso? Will I need a Leh bike for Tso Moriri and Pangong Tso evening if coming from Manali? 3) I have booked some accommodations but not all. Do you recommend booking all accommodations ahead of time for smaller towns or will I be able to reasonably find accommodations on arrival on the last week of September and first week of October? 2. You will have to go to Leh first to get a Leh registered bike and also your permits. Manali rented bike won’t be allowed, will have to leave that parked in Leh. 3. No need to book. It is end of the season and you will easily get a place to stay. I see that the weather forecast shows high temperatures during the day of -5C to -10C for days around the end of the month and beginning of Oct.
Is it unsafe to travel on days where the daytime highs do not go above 0C? Or will the sunshine melt most of the black ice? Also can you recommend a good weather forecast site for Ladakh region? Many of the sites I see show conflicting forecasts. Sunshine will melt most of the ice, just wait for the sun to come up before you start. I am sorry but even I am not aware of a weather website that can provide accurate information. Just wanted to check one information. Earlier Ladakh festival used to happen from 1st to 15th September. Than it shifted to 20th to 26th September every year. Has the duration of the festival now been shortened and dates have changed because this year Ladakh Festival is held in name of Ladakh Tourism Festival from 22nd to 25th September. Any idea? Is there any word limit to post a comment? 1. Should I go from Nubra to Pangong directly and then come back to Leh or Nubra to Leh and Leh to pangong? 2.Mode of local transport. Shall I hire a single cab for complete tour or hire a shared taxi? 3.can we get inner line permit on saturday? Since friday( 21st sept) is a gazetted holiday. 3. In the first half of the day, yes. Thank you vargis ji for your guidance. I have another query regarding ILP. Can I get ILP on 4th Saturday(22nd September) as J and K bank remains closed on 2nd and 4th Saturday. Just needed information regarding pangong, I heard government(my travel agent informed me ) has asked all camps to wind up before 20th September this year. Do you have any knowledge on that . Hey Vargis bhai… waiting wa for your input . Sourav Bhai that is correct. No more camping at Pangong after 15th. Leave early from Leh, visit Pangong and return by evening. Or look for a home stay at Spangmik, that is the current situation. Also are tickets for buses from Srinagarto Leh easily available or I have to book in advance? Is Leh-Manali route advisable since there are no HPTDC buses after Sep15. What are the alternatives? 2. Tso Moriri to Sarchu – You will have to hitch hike. No public transport available. we are planing 9 days trip leh Ladakh and I already messaged regarding the itinerary before and u said its good. I have one doubts to clear. we are planing to visit tso morriri (by taxi) and one night stay there and return on next day morning. we want cover a road trip in the “more plains” region of pang to tanglang la on the same day while going back to leh. is there any road which connects tso morriri to pang or more plains region? other wise how we will plan this road trip? Hi Hadi – Yes. While coming back to Leh, you can take the road via Tso Kar and it runs right through More Plains. I heard some people are blocking rental bikes or cars taken from Manali while going owards leh-ladakh. No problem until Leh city but you cannot take these to other areas in Ladakh. For that you will have to rent another bike from Leh itself. This is really helpful information for those who planning to travel in Sep. I will arrive Leh on 7th Sep by flight as a solo traveler. Will it be easy to find people to share taxi to visit places around leh. I mean how do I meet fellow travelers willing to share taxi cost. Hello Sanju – Yes you should be able to find a shared cab easily. Just go to the main bus stand in Leh. Since it’s only two of us can you just provide us an estimate of budget part. We have already booked tickets till Chandigarh and return from Jammu. But now scared about the long journey and of course on the budget. I am also travelling to Leh with few friendsm but in first week of September. Can you help with your timelines and itinerary? Hey Supriya – I have the same timings. 1st I will reach Manali, will head towards Leh on 2nd morning. And I have return flight on 12 from Leh covering Nubra, Pangong, Tso Moriri. how are you traveling from Manali to Leh and in rest of Ladakh. For better communication please ping me on 7018547184. Thanks for this excellent blog on Leh-Ladakh. Very informative. This is a one stop place to know about the region..
Planning to start journey from Pune on 6-Oct-18. Will it be advisable to visit Leh during this period? trip by car. reach leh by 8/9 oct via srinagar-leh road. Follow your 4/5 day itinerary. No offroadings, follow your hatchback-safe routes. return back via manali. Please suggest..
Hey I am traveling alone in September is it safe for solo female travellers?? As far as I can tell yes. I have never heard any women traveler talk about any security concerns there. Thanks so much..I have read almost all your blogs about leh they were all very helpful.. I also wanted to know about sharing cabs to Nubra ,Pangong and Tso Moriri will they be avalaible mid September? Hi Rahila – Yes shared cabs will be available in Mid-September. Hi Rahila — I also am a solo female traveller and will be in Leh from Sept 11-21. Let me know if these dates line up with yours and you are interested in booking some shared taxis etc. together! Happy to share my email. Thank you for the useful and informative tips. Our trip will be on mid Sept 2019. Thanks Rus. Welcome to India and I am glad that the information as of help. Thank you Mr. Parmar. I am glad that the information was of help.